When we think of libraries, we think of books. Libraries in BC (British Columbia) do offer books – in many different languages, in fact. But, sometimes we forget about all of the many other things that libraries in BC offer. Here are only a few examples of what libraries in BC offer. To learn about more, go to http://newtobc.ca/libraries/library-programs/. Have you ever wanted to replace a broken part, customize your own cookie cutters, or design a prototype? The Richmond Public Library (RPL) Launchpad has four bookable MakerBot Replicator 3D printers. If it’s your first time, be sure to get certified through their group 3D Printer Orientation. If you are already certified, you can book your time on their online booking calendar. The North Vancouver City Library hosts a summer tradition of ‘Family Movie Nights in the Plaza.’ Movies are shown in Civic Plaza in July and August! Families can come down to Civic Plaza for a night packed with family fun. The movies are shown on a big outdoor screen at sunset. Before the movie begins there’s lots of family-friendly activities, piano sing-alongs, face painting, entertainment and a bike rodeo. The 2018 movie line-up is coming soon. At your local library you can borrow CDs before deciding to buy an artist’s music. Saves money by listening to the whole album before you invest in purchasing it. You can also try music outside of your typical listening genre – try some world music, blues, country music, or jazz. Libraries in BC, including the Port Moody Public Library, offer free online access to magazines with your library card. Read your favourite magazines on your computer or download them to your smartphone or tablet through the Library’s subscription. Libraries in BC, including the West Vancouver Memorial Library, offer free access to newspapers from around the world! Digital versions of current newspapers and magazines from all over the world, in dozens of languages. Search by country, language or name of newspaper. Includes today’s Vancouver Sun, Province, and Globe and Mail. Rolling archives of all papers, from 5 to 90 days old. Use the app to access and download your favourite titles anywhere. Many libraries in BC lend musical instruments. The Fraser Valley Regional Library is best known for their ukuleles. Fraser Valley Regional Library (FVRL) offers ukuleles for loan through its new Uke ‘n Play collection. Customers can check out the instruments, free of charge, for a two- or three-week lending period – just like library books. Soprano and concert-size ukuleles in various styles will be available through FVRL’s network of 25 libraries. Each instrument will come in a kit that includes a ukulele, a soft ukulele case, a digital tuner and a beginner ukulele book. The Burnaby Public Libraries offer equipment lending services. Cameras, camcorders, and other equipment to help you capture the perfect moment, are available for loan at the Tommy Douglas Library. The Tommy Douglas computer lab is also a great space for working with photos and video, with 12 PCs and two iMacs, access to Photoshop Elements, Premier Elements, iMovie, and two flatbed scanners. 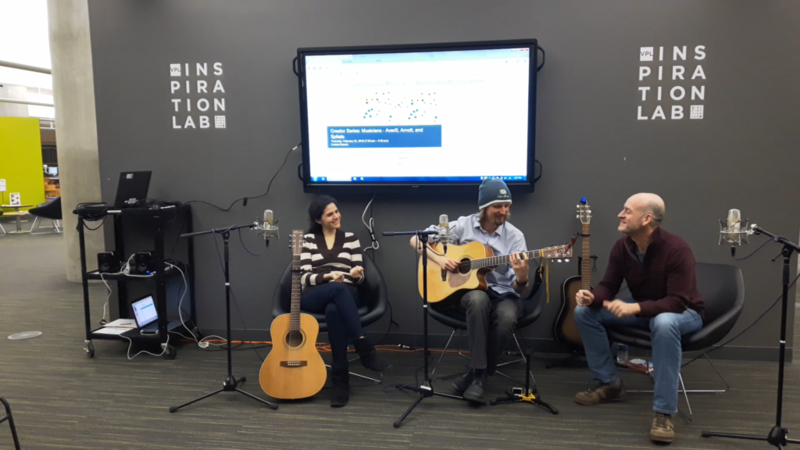 The Vancouver Public Library has four rooms dedicated to recording studios, audio and video, in its world renowned Inspiration Lab. This space is dedicated to digital creativity, collaboration and storytelling… and all free, with your library card! The Inspiration Lab features high-performance computers, analog-to-digital conversion, sound studios, video editing and self-publishing software. Libraries in BC have meeting rooms where they hold activities and workshops. These are free, and cover a wide variety of topics and interests, ranging from children and caregiver programs, to writing a proper resume. The Surrey Libraries calendar is chock full of events that cater to a wide range of audiences. This month, you will find ESL Bookclub, Settlement Services for Newcomers, English Conversation Programming, and Technology help. While I’ve highlighted just a few of the perks of libraries in BC, there is so much more to explore. What do you use at library that saves you money? I would love to hear about it.